Sensory needs tend to be fairly hit-and-miss in how well they are accommodated. People with little or no understanding of autism sometimes have no idea that sensory differences are even relevant. People with slightly more understanding often have good intentions but make changes based on misinformation or simplifications. The fact is, just like in all areas, there is a huge range of variation in sensory needs among autistic people. There’s no simple approach to accommodating us. Autistic people’s brains are wired differently in ways that mean we experience sensory input differently to non-autistic people. That covers anything from synaesthesia, over- or under-sensitivity, specific sensory ‘intolerances’, perceptual distortions, strong preferences or aversions to using particular senses, and more. 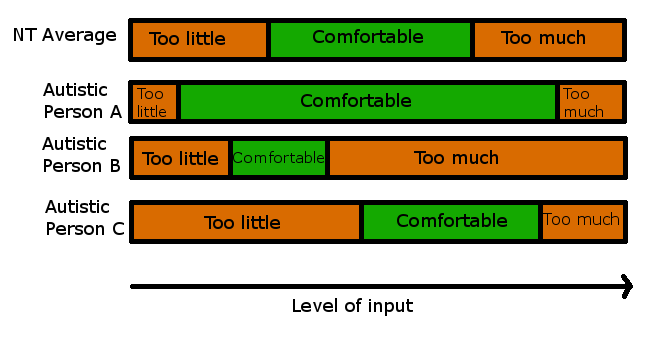 The easiest of these differences to understand (as well as one of the most common) is about comfort with levels of input. Everyone – autistic and otherwise – has a comfortable range of input for each sense. For example, you have a comfortable range of temperature – if you’re much hotter or colder than your comfortable range, then you’ll be unhappy. Similarly, you have a comfortable range of volume – if it’s too loud you might get a headache or feel stressed, if it’s too quiet you might be unsettled or anxious. Most NT people have a pretty similar range of comfortable input. The point at which a sensation is “too much” or “too little” is mostly the same from one NT person to another. And there’s generally a pretty good correlation from one sense to another, too. In comparison, autistic people tend to have much more varying levels of comfortable input. That means their comfortable range might be a) much narrower or wider than the NT average, and/or b) offset higher or lower than the NT average. Not only that, but the comfortable range in one sense may be offset or expanded in one way, and the range in a different sense might be offset completely differently. All in all, autistic sensory experiences are a classic example of how we tend to occupy the extremes of any bell curve you care to mention. But different comfortable ranges are not the only thing that can be different about autistic people’s sensory experience. There are also all kinds of even more specific and individual differences. It’s pretty common to have what I think of as sensory ‘intolerances’ – specific types of sensation which are unbearable, regardless of the intensity of input. For example, a person might react very strongly towards one or more particular textures, tastes, smells, sounds, etc. There’s also the opposite – particular types of input which a person craves or enjoys a great deal. And just as before, you’ve guessed it, there’s no pattern or predictability to these. One person’s intolerance might be another person’s favourite sensation. Another fairly common experience is to have trouble with processing certain types of sensation. That may apply to just one sense – many people have auditory processing issues that make it hard to understand speech or to distinguish between different sounds. Or it might be with all sensory input – having too much input in any combination of senses can be overloading and make it difficult to process or interpret anything else. Hopefully you now have a general understand of how autistic people’s sensory experiences differ from neurotypical people’s, as well as how much variation there is across individuals. Now it’s time for some advice on how to apply that understanding to making your event accessible for autistic people. I’m going to divide this into some general principles about how to approach things, along with specific examples and advice. We’ve already gathered the fact that autistic people aren’t all over-sensitive or all under-sensitive. But in spite of this, it is important to reduce input as much as possible. In general, it’s worse to have too much input than not enough. If you don’t have enough input, you might be bored, restless, or uncomfortable. It’s not nice, but it’s generally possible to handle it. You can find your way to a situation with more input as quickly as possible, or provide input for yourself (who hasn’t tapped their fingers while bored in a waiting room?). In contrast, having too much input can be actively dangerous. When a person is overloaded, they may partially or completely lose the ability to process further input. That means they could be disoriented, may become unable to understand speech or other communication, and be incapable of finding their way safely to a more comfortable environment. They might also struggle with internal processes, meaning they could have trouble making decisions, understanding and remembering what’s happening, or expressing communication. That includes being able to recognise and express the fact that they are overloaded and need help. This can be terrifying and dangerous. In comparison, the risk of feeling bored or restless is greatly preferable. Whatever public or central areas the events are taking place in. Any facilities people may need to use (toilets, cafés, etc). Any location that someone attending the event might want or need to be in, in order to fully experience the event. Sounds like radio, music, or audio announcements. Noisy tools, machines, or activities. Videos, moving or flashing lights. Attention-grabbing images, objects, and displays. At the event I went to that prompted this series of posts, the corridors of the venue were full of ‘things’. There were stalls and displays with people offering leaflets or selling things, as well as benches and tables dotted around where people would sit and socialise. This made it impossible for me to move from one part of the event to another, without being bombarded with input and overloaded. Even the entrance of the venue was overloading. Right inside the front doors at registration time, there were stalls along the walls and a huge crowded queue filling up the space. You couldn’t even get in to the event without a sensory assault. I can’t bear to think about how many people might have arrived, taken one look at the entrance area, and left immediately. The ideal low-input location is, essentially, ‘boring’. As little as possible for you to look at, hear, or pay attention to. Remember, this doesn’t mean there won’t be input for the people who want it (more on that later). But it means people who can’t handle input can experience the event with as little as possible. We’ve covered the main areas of the event, and made them as safe and comfortable for everyone as we can. Now it’s time to provide the choices which will allow anyone to find an enjoyable and comfortable level of stimulation. There need to be multiple places where people can go to find different levels of input. The simplest version of this is to have a low-input room, and a high-input room. The low-input room should have all stimulation reduced even more than in the main areas, and it should be strict. This room is for people to go to when even the quiet and comfortable main areas are too overloading! There should be no talking, low lights, no noise, and no moving lights, images, or objects. It should also ideally provide comfortable places for people to relax while they are in there. That means things like seats, cushions, and plenty of space to move around the area without bumping into things or each other. The high-input room should have no restrictions on the input people can bring to it. This room should be able to accommodate people who need any level of input to be comfortable, no matter how high! People should be allowed to talk, shout, clap, make noises, jump around, and do whatever they need to give themselves enough stimulation. There should also ideally be sources of input for people to use if they need – things like sensory toys, lights, things to touch, move around, and play with. There should also be plenty of space because people may need to take up space to be comfortable, and don’t want to risk hurting or making each other uncomfortable. Having these two options is the ideal minimum, but more is still better. More different levels of intensity and separate levels of intensity for different senses would be even more ideal. This final point covers all the individual differences that don’t fit into just being over- or under-sensitive to one sense or another. Things like processing issues or specific intolerances mean that certain types of input may be difficult or impossible for a particular person to use or enjoy. So, choice is the key here too. Whatever information, input, or experiences are provided at the event, should all be available in as many different formats as possible. If there’s a lecture, the slides should be available as a handout for people to read at the event (not sent out as an afterthought later). If there’s a written timetable, a visual representation should be offered too. If there’s a map of the venue, arrows or directions in words should also be provided. All of these changes will allow autistic people with specific processing differences to take in the event in their preferred way. If someone finds it impossible to concentrate on or process spoken words, they can still appreciate a lecture by reading the slides or written summary. If someone is unable to understand a visual diagram, they can navigate the venue by using a different format of directions. These options aren’t just autism-friendly, they are vital accommodations for people with all kinds of disability. For example, people with hearing or visual impairments will benefit from having information available in multiple formats. Accommodations like this have no downside for anyone. No-one attending your event will suffer by being offered a choice of formats to experience. Minimise unnecessary input in all necessary or main areas – make it ‘boring’. Provide a range of possible input levels so that everyone can find their comfortable range – ideally at least a low-input room and a high-input room. Provide all information and activities in as many formats as possible, so that everyone can experience the event in the best way for them. Even these ideas can be simplified back to the basic principle: choice is key. People are all different, and autistic people sometimes especially so. The key to accommodating us is to recognise that we are all different, and give us all the option to find our own comfort. I love this and found it super helpful. I’m self-diagnosed and trying to learn more about the spectrum, but it’s really great to have it laid out like this. This, again, seems like some really good ideas; thank you. Essays on lots of things since 1989. Adding just one more to my cluttered life.